1. Is your competitive advantage sustainable? 2. Does your product create network effects? 3. Is your business a one hit wonder? 4. Are your customers "locked in"? 5. How high are your gross margins compared to the competition? If you haven't read the first part of the article, feel free to give it a quick read now so you can better understand why these questions are important. So, here's the next five questions that you can use to weigh up the attractiveness of your business model. 6. Do Higher Revenues Improve or Depress Profit Margins? Investors love a company that can be scaled up as that is where the possibility for the best returns on investment lie. However, scaling a business is an often misunderstood concept. It does not simply mean that the business is capable of getting bigger. That would be true of almost every business. A business can only truly be said to be scalable if it has operating leverage. In other words, if additional revenue requires relatively smaller and smaller additions to operating costs you have operational leverage and your business can accurately be said to scale. However, a business that adds revenue and operating costs at an equal rate or even adds costs at a greater rate than it can add revenue cannot be properly said to scale, even if they could get alot larger in terms of both their revenues and gross profitability. Investors will value a company higher earlier on if higher revenue equals higher profit margins. These businesses are truly scalable and are therefore deemed more valuable by investors. 7. Is the Customer Base Concentrated or Fragmented? Investors prefer a businesses customer base to be fragmented rather than concentrated. This the because the greater the concentration of customers, the greater the power those customers have. They can become "price makers" rather than "price takers". 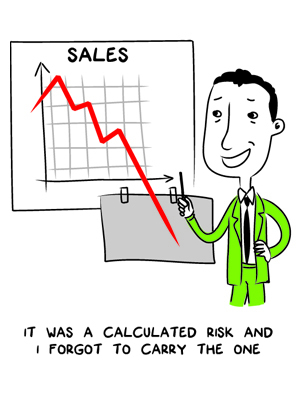 This is dangerous for your business and can lead very quickly to the erosion of margins and even the complete destruction of the profitability of a market, especially in highly competitive industries Does your business have a few, large customers or many, smaller customers? Generally speaking, the longer the tail of customers in a business, the greater the influence the business can have on the bulk of the market, which will generally result in better margins. 8. Is The Business Highly Dependent on Any One Partnership? Investors will typically discount the valuation of any business if they are highly dependent upon a particular partner. Any such dependency increases the vulnerability of the business to a sea change in that relationship. Any business in which a partner has significant power may also experience margin erosion should the partner choose to use that power to negotiate a better deal for themselves. If you are in a situation where you are heavily reliant upon a partner such as, for example, Zynga who produce games used overwhelmingly on Facebook (over 80% of their revenue comes through games played on the social network), there are steps that you can take to mitigate some of the risk. You could seek alternative partnerships, as Zynga themselves have sought to do by establishing themselves on mobile phone platforms such as Android and Apple iOS. You could also look to take some of the functions for which you depend upon your partner inhouse, like Zynga have done by establishing their own gaming platform (www.zynga.com). Examining and, if possible, reducing your dependence on any one partnership ought to be an important part of a businesses long term strategy; one which if done successfully will pay dividends in terms of a higher business valuation. 9. Is Marketing Organic or Dependent on Heavy, Continual Investment? Investors love business where sales growth is largely achieved through word of mouth. The lower the customer acquisition costs, the more valauble your business will be perceived to be. Does the visibility of your business increase through word of mouth? How do your customer acquisition costs compare to your competitors? What is the difference between customer aquisition costs and the average lifetime value of a customer? Having worked side by side with many professional investors, I know that they are often most attracted to businesses in which the customer acquisition cost will be repaid by the customer in a year or less, especially where the average customer relationship will last for several years. 10. How Fast Is the Business Growing? The faster you are growing, the larger your future cash flows and revenues will be. High growth also serves as evidence to investors that your business has tapped into a lucrative market opportunity. How does your business growth rate compare to that of your immediate competitors? If your business is growing faster than the current rate of interest readily available to investors at banks and othe financial institutions, then you can be sure that your business will attract more interest at a higher valuation from investors than would an identical business growing at a more modest rate. If you've asked yourself the ten questions that we have just outlined, you will have a good idea of the relative attractiveness of your business model. That is not to say that any busines that is weak in any of these areas would automatically be unattractive. A business with a strong showing in just a few of these areas would be deemed a good business and worthy of investigation by any reasonable investor. Please be careful, especially when starting a new business, to take some time to evaluate your business model. It may need a little refinement as a consequence of the answers to the questions we have outlined. It may need a complete rethink. Alternatively, you may draw confidence from the results of the evaluation and can proceed with steam in your stride knowing that you are on to a good and potentially lucrative thing. If we can help you in any way in assessing any business ideas you may have or if you are at a crossroads in your business and want to review it's current performance, please don't hesitate to get in touch.